24" x 26", 375 hp @ 115 rpm engine built Klotz & Kramer, Sandusky, OH. 8' x 16' firebox boiler. Laid on bank of Sydenham River below Wallaceburg. 1884 Struck reef 1 1/2 miles west of Kelly's Island. 1890 Cut down to tug Toledo, OH. 1891, Jun 13 Collision with tug ALVAH B. 2 miles off Cleveland. Tug AMERICAN EAGLE sank, crew saved. 1892 60 skaters stranded on ice floe that AMERICAN EAGLE broke loose Sandusky Bay. 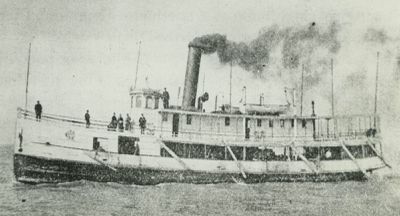 1901 Sold to Lafe S. Sullivan, Toledo; cut down to tug, Gillmores Shipyard, Toledo, OH. 1907 Burned Toledo, OH; repaired. 1910, May 30 Rebuilt Wallaceburg, ONT by Lee Brothers as Canadian tug or passenger boat; never finished.